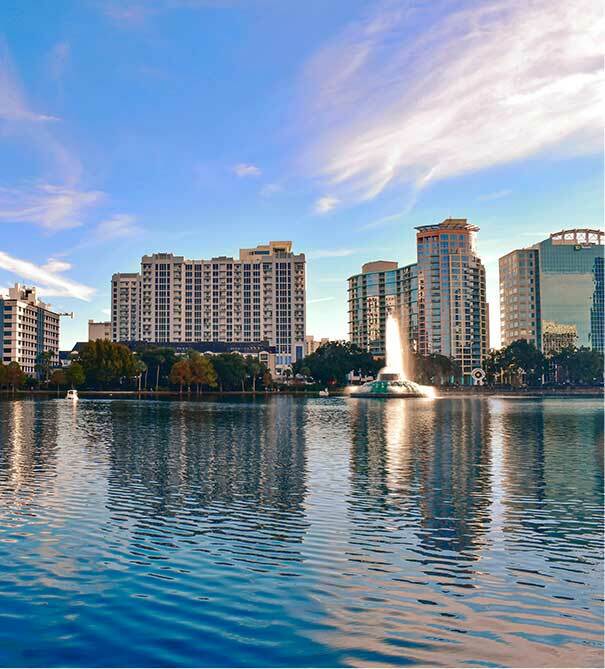 Orlando is nicknamed "The City Beautiful" and its symbol is the fountain at Lake Eola. Orlando is also known as "The Theme Park Capital of the World" and its tourist attractions draw more than 51 million tourists a year, including 3.6 million international guests. The Orlando International Airport (MCO) is the thirteenth busiest airport in the United States and the 29th busiest in the world. Buddy Dyer is Orlando's mayor. As the most visited American city in 2009, Orlando's famous attractions form the backbone of its tourism industry: Walt Disney World Resort, located approximately 21 miles (34 km) southwest of Downtown Orlando in Lake Buena Vista, opened by the Walt Disney Company in 1971; the Universal Orlando Resort, which consists of the two parks of Universal Studios Florida and Islands of Adventure; City Walk; SeaWorld; Gatorland; and Wet 'n Wild Water Park. With the exception of Walt Disney World, most major attractions are located along International Drive. The city is also one of the busiest American cities for conferences and conventions. 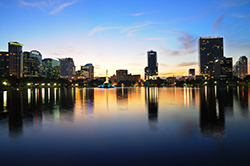 Like other major cities in the Sun Belt, Orlando grew rapidly during the 1980s and into the first decade of the 21st century. Orlando is home to the University of Central Florida, which is the second-largest university campus in the United States in terms of enrollment as of 2012. In 2010, Orlando was listed as a "Gamma−" level of world-city in the World Cities Study Group’s inventory. Orlando ranks as the fourth most popular American city based on where people want to live according to a 2009 Pew Research Center study.